This deanery was started in 1931 at Namungoona near Kampala city by the Late Bishop Spartas. It has a Population of faithful of 3500 and above. The Central Church of this deanery is St Nicholas (consecrated 1965). The Dean (Arc hieratic Dean) of this deanery is Fr. Emmanuel Sekyewa, Theologian/married.It covers a radius of 40 kilometres and above with at least more than 11 priests. This deanery was Started in 1922 in DEGEYA by a Group of believers self-named «ANOONYA» (Μt.7, 7-8) it has a Population of faithful of over 5,500 spread. The Central Church of this denary is the Holy Transfiguration church in Degeya-Anoonya which was consecrated 2002. The Dean (Arc hieratic Dean) is Fr. John Kibuuka (Theologian, married) and it covers a Radius of 70 plus kilometres with at least 13 priests. Distance from Archdiocese : 50 kilometers. This deanery was started in 1930 in LUWAYO by Fr. Obadiah BASAJJAKITALO (+1985). Currently it has a Population of faithful of over 3,500, spread and St. Procopios as its Central Church which was consecrated in 1966. The Dean (Arc hieratic Dean) of this deanery is Fr. Charalambos MUTALAGWE,Maried. The deanery covers a Radius of 70 plus kilometers with total of 8 priests (unable to cover the sub parishes). This deanery was started in 1939 in NAKABALE by Fr. Joachim FOOLA (+1995). It has a Population of faithful of 5,000 and above, spread with the church of Apostle Paul as its Central Church consecrated in 1994. The Dean (Arc hieratic Dean) is Fr. Stephen LUNAGULA, married. This deanery covers a Radius of 70 plus kilometers with at least 9 priests. This deanery was started in 1930 in (NSINZE) by the late Fr. Cyrill PASHA (+1990) and it currently has a Population of faithful of 12,000 and above, spread. The Central Church of this deanery is St Spyridon which was consecrated in 1972. The Dean (Arc hieratic Dean) of this deanery is Fr.Thomas WANANDA (Married) and it covers a Radius of 100 kilometers and above with a total of 7 priests, able to cover the parishes. This deanery was started in 1935 (BULERA) by the Late Jonathan SERWANGA. It currently has a Population of faithful of 3,000 and over, spread with its Central Church Stone laid on 25/01/2003 at St Gregory, KIREKU. The Dean (Arc hieratic Dean) is Fr. 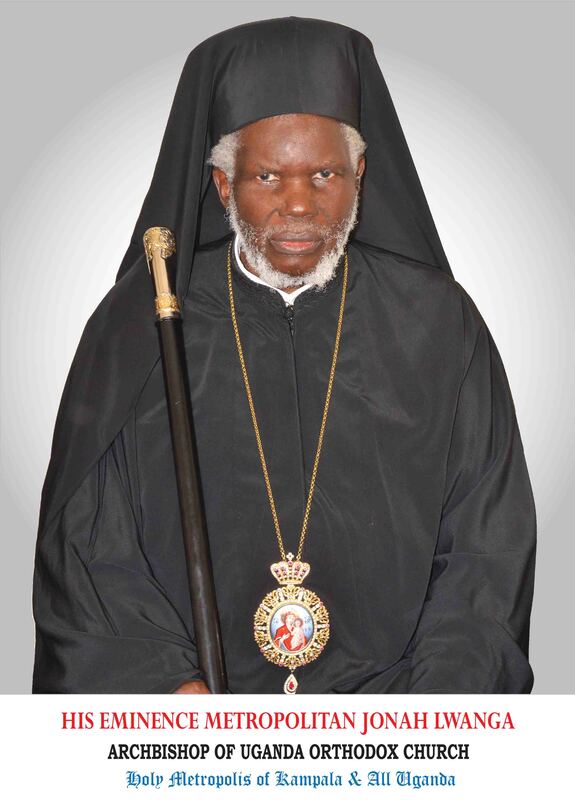 Anastasios ISABIRYE (Theol. /married) and this deanery has a total 5 priests, able to cover the parishes. It covers a Radius of 90 plus kilometers with a distance of 80 kilometers from Archdiocese. This deanery is located 320 kilometers to the west from the Archdiocese and it was started in 1959 (NGOMBE) by a Lay teacher, MUKUUTA MOSES. It has a Population of faithful of 1,500 and above with the Ascension church as its Central Church which was consecrated in 1994. The Dean of this Deanery is Fr. Constantine MBONABINGI (Theol. /Celibate). It covers a Radius of 80 kilometers plus. This deanery was started in 1934 (ALEPA) by the Late Fr.Athanasios OTIM (+1991) as its founder and it has a Population of faithful of 2,000 and above, spread with the church of St. Athanasios (the Great) as its Central church. This Deanery covers a Radius of 100 kilometers and above with 2 priests (unable to serve the needs of the area). The Dean of this deanery is Fr. Emmanuel ORUK (Theol. /married). This is found in the Northern part of Uganda and it was started in 1937 (LABORA) by the Late Fr. Athanasios OTIM (+1991) as its founder. Currently it has a population of faithful of 2,000 and above, spread with St. Lavrentios, KORO, GULU as its central church. It also has a total of 7 priests (unable to serve the needs). This deanery covers a Radius of 100 kilometers and above. Its Dean is Fr. Julius ORACH (married).